This bold and sassy blend of spices has become an all-purpose seasoning in American kitchens. Adds that extra zip to almost any anything. Delicious as a rub for catfish, grilled chicken wings, steaks, chops, ribs, red snapper. To blacken meats, simply rub the meat with a tiny bit of oil and dredge the meat in the seasoning, then pan-sear the meat. Provides a zesty flavor to everything from eggs to sandwiches, greens to potatoes. 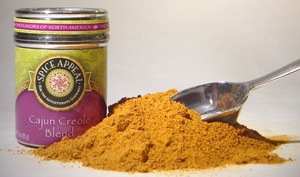 Hand-mixed from a variety of spices including: paprika, whole thyme, basil, salt, onion, garlic, black pepper, oregano, cayenne pepper, and other spices.